Hi all! Okay so it has been a few days….I was going strong with everyday posts- but “life” …..baby, work, social life etc., took over this past week! I am back with a post about my favorite platform sandals for summer. It has been warm for about a week and the month of April hit- so you really can’t kick it in your wintery looking shoes anymore. Pack them away in their pretty little boxes and shop on one of my favorite shoe sites for some fabulous spring shoes! First pick are the Joie Escapade retailing for $345.00- Loving the gladiator inspiration and the “tough” look of the shoe. Would look super cute with a flowy floral number….. opposite styles that would really compliment eachother. 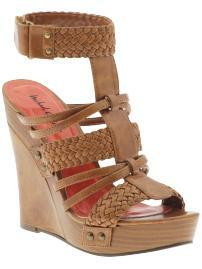 Next is the Michael Antonio Hadrian in tan. This retails for $70.00, a much less expensive way to achieve the gladiator look. Loving that this is a wedge, alot easier to wear for longer periods of time. Good and bad news on this one….it is synthetic so it is not real leather- which can be a benefit as the shoe will be really light and easy to walk in for spring. Some folks don’t like a non leather shoe (and the way it feels on their feet) so if that is you, you will want to pass on this one. Third is the Joie You’re so Vain sandal in Misty Rose for $325.00. Loving the sort of off beat color on this thong platform sandal. Sort of a pink beige. Would go with EVERYTHING and is a nice change from tan or gold. 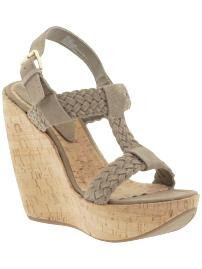 Fourth and final pick for today is the Mia Christina sandal in sand suede (also available in black) for $69.00. This is a great price for a suede shoe. Basically the bottom part of the shoe is synthetic, making it lightweight and easy to walk in, but the footbed is padded in leather and the top of the shoe is all genuine suede. Sort of the best of both worlds- less expensive price tag, great look, and all the parts that touch your feet are genuine leather/suede. Definitely a GREAT shoe for spring. All of the above are available now at www.piperline.gap.com. This is a fantastic shoe site (also carries accessories and apparell) so enjoy checking it out. Also fun to check out the “Rachel Zoe Picks” section- she is an incredible celeb stylist and always has great suggestions. Next Next post: STUART WEITZMAN "ALEX" is a MUST HAVE!